In a medium saucepan, prepare orzo according to package instructions. Reserve. In a large stir fry pan or wok, heat oil over medium-high heat. Brown chicken pieces. Add garlic powder, ginger, ¼ cup apple cider, salt and pepper. 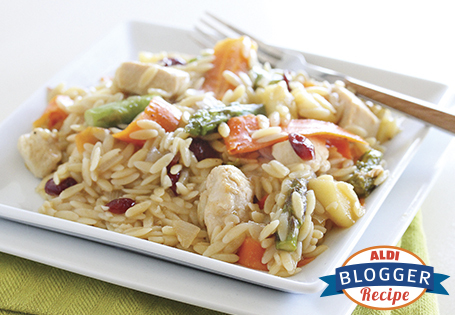 Once chicken has lightly browned, add onion, carrots, asparagus, cranberries, apple and ¼ cup apple cider. Stir fry until vegetables are tender, about 5-7 minutes. In a medium saucepan, over low heat, combine remaining apple cider, corn starch and soy sauce. Whisk until smooth. Continue cooking until slightly thickened. Add cooked orzo to stir fry pan, top with the thickened sauce. Stir to combine. If orzo is unavailable, couscous is a flavorful alternative.